While rummaging through some boxes in search of the frustratingly small but surprisingly inspirational book The Elements of Style, I came across a sketchbook from a former phase of my life – a phase when I wanted to be a full-time computer programmer. I have developed a few very simple iPhone and iPad applications, and I still have sketchbooks that help you get your initial ideas down before you start to write code. When I found one of those sketchbooks I decided to re-purpose it. I didn’t really plan on creating the sketch above (click on the image to view an enlarged version), which is essentially a summary of how I approach the visual notes that I post to this site, but after writing the title it all just started to flow, so I went with it. 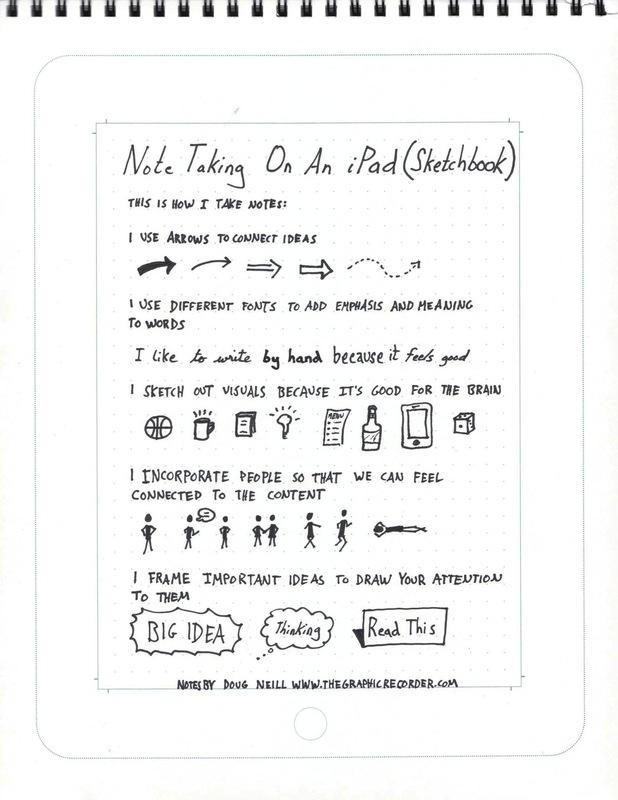 I’m on a journey to become a better visual note taker. To see some of the resources that I am using on that journey, as well as some resources that I have developed, check out the Visual Note Taking Resources page.